Ever wondered how Apple or Google determine the most likely next word in a text message or email thread? Have an idea for an app to generate a sequence of text influenced by your favorite book, author, or playwright? Then this example is for you! Most of us are able to intuit that the likely next word is either “restroom” or “bathroom”. This seems natural. Truthfully, it’s just a pattern, and one that a computer can recognize given enough examples to learn from. Just like any ML model, the way in which the next word is selected is based on training data that it has seen. Train a language model on a subset of Shakespeare’s plays, and your app will generate text that sounds like a sixteenth century English playwright. Train it on DC comic books, and you’ll get word generation for superheroes. Predicting the next likely word in a sequence is no different than predicting tomorrow’s closing stock price for your favorite company, given the last month of price movement. Actually — it’s much easier than that because believe it or not language is a fundamentally sequential (and logical) type of data. The only major difference here is that instead of numbers, we are dealing with words. So, the first step in any type of language modeling approach is to convert the raw text, through a series of pre-processing steps, into sequences of….you guessed it… numbers. We will take the raw text, strip out non-ASCII characters, convert everything to lowercase, remove punctuation, and then map each word to a unique integer. Now here’s where the real “magic” comes in. We have pre-processed our text and generated training data sequences for the model. We’ve all likely heard of neural networks at some point. In this example, we leverage a recurrent neural network architecture to model the sequences of text. In short, as we pass these sequences of numbers to the model during training, it retains information about patterns and relationships that tend to be predictive of the next word. For a deeper dive into RNNs, check out this awesome blog post! For those of you that would prefer to jump straight to the code: here it is. Figure 2. Create a new standard project on Skafos to get started. Figure 3. Import python dependencies. The training data we need to build a language model is just any bit of formatted text (meaning sentences that are for the most part grammatically correct). The more data you can get your hands on, and the more you like the tone and diction of the text, the better your model will meet your standards. For this example, and for the sake of speed, we will use an existing dataset of Yelp business reviews. This is the same dataset used to train and deploy the Text Classifier model with Skafos. I chose this dataset for the language modeling example because it is familiar, easily accessible, and quite frankly… just funny! Don’t feel like you need to stay with that data beyond this example. In fact, I encourage you to go find your own text data to build a language model on. Figure 4. Load text training data. Figure 5. 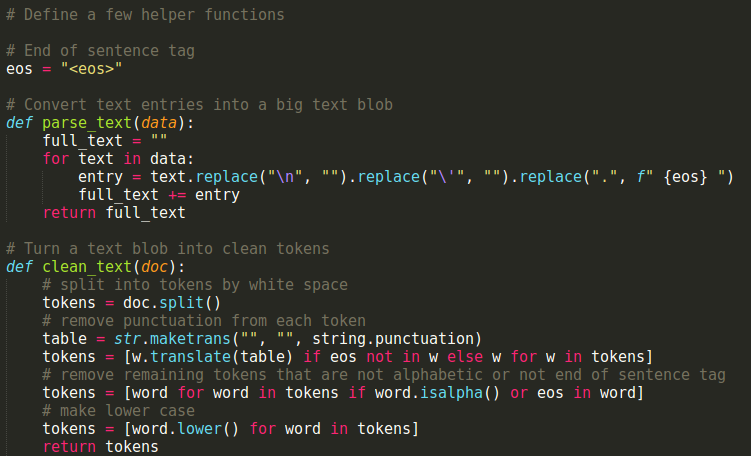 Helper functions to process the text. Figure 6. Parse and clean the text. Figure 7. Split text into sequences. Lastly, we need to convert the processed text, now organized in sequences, to numeric form. We do this by mapping each word to a unique integer index. Fortunately, Keras has a nice tool that allows us to do this easily (Tokenizer). Figure 8. Convert sequences of text to sequences of integers. Figure 9. Split into X and y for model training. First things first, we declare a base neural network class for us to start building our architecture, layer by layer. The first layer in the network is an embedding layer that takes a sequence of 10 integers (each mapping to a corresponding word) and extracts a 32-length vector for each to use as inputs to the LSTM layer (this is the recurrent layer of the network). Lastly, we use 2 Dense layers to output the probabilities of each word in the vocabulary given the inputs. I included links to the Keras documentation where you can learn more about each specific layer. Figure 10. Construct and train a RNN model. With any neural network, picking the right hyper-parameters is key (and also more art than science, if you ask me). Most of those choices depend on your training data, time frame, and required performance threshold. But honestly, don’t even worry about that part until you get something working end-to-end. So many data scientists and machine learning engineers get lost in this step. We iterate for weeks on end, following a rigorous scientific method, but often run into integration challenges after they have burned precious weeks building the perfect model. Don’t do that. Get your model hooked up to your app first, and then iterate on it. Because Skafos can “push” model updates to your app, you can iterate to your heart’s desire. Now that the model has been trained, here is a function you can use (in python) to generate new text based on some input. This is a good thing to do in the JLab before deploying to your app to make sure it’s doing what you’d expect. Figure 11. 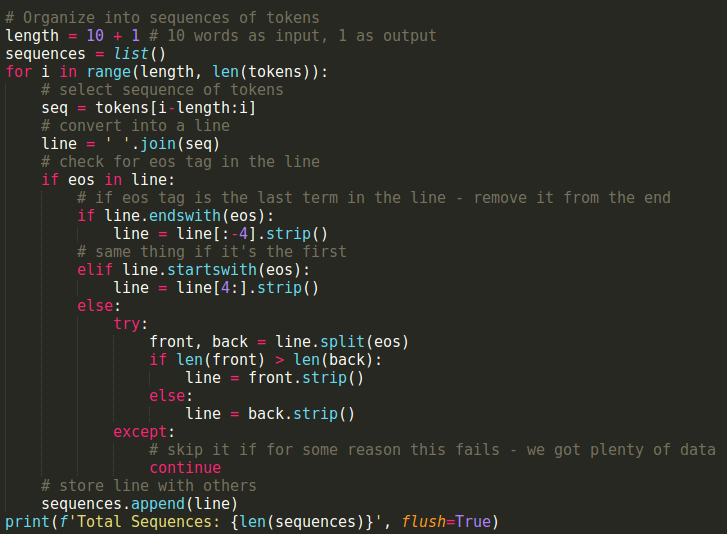 Code to test the language model by generating new sequences of text given some seed text. Give it a whirl! Try out other seed text to see where the model takes it. The longer you train, the more likely it will make sense. However, the longer you train, the more likely the model will over fit to the particular linguistic style of the text you trained on. The results can be quite humorous.. Figure 12. Try out the language model! Convert the model to Core ML format: This makes the model class accessible in Xcode. Figure 13. Export model to Core ML format. If you haven’t already done so, configure your iOS app settings with Skafos on the project page of the dashboard. Enter the required ID’s and Keys, then head over to the integration guide. Figure 14. Project page — model delivery settings for integrating with iOS app. During step 1 of the integration guide, instead of downloading an initial model from the drop down list, click here to download a pre-trained model along with a word-index dictionary JSON file (zipped). Add those to your Xcode project resources. From here on out, the Skafos framework will handle automated model updates to your devices. You can trigger model updates over-the-air using the Skafos SDK save and deliver methods. This way, you can retrain or update your model in the JLab environment on Skafos, and have your changes propagate to your applications. This model is a bit more advanced, so it is a bit trickier to deploy and use on devices (I trust you can still do it)! Remember that pre-processing work we did, converting text to integers and what not? Well, in order to use a language model like this in your app, you also need to include the mappings so that the results of the model can be translated into human readable text. Each time you save and deliver a model, you also need to include the word-index dictionary.json file that you can integrate into your app. Skafos can deliver these as a zipped bundle! Stay tuned for another blog post coming that will show you how to build a sample iOS application using the model we just saved. Thanks for following along! I hope you learned something new and now have the tools to build an awesome language model. Get after it! Fork and Clone the project repository in a Skafos Jupyter Lab. Try swapping out the text training data for something else. Shakespeare, movie scripts, text messages, etc. Adjust the number of training epochs or tweak the number of hidden layers in the neural network by removing them from the model constructor code. Here is a list of some other iOS app templates that you can use to get rolling! Reach out to us on our Slack Channel or find us on Reddit.